^ Simon Kitson. "Vichy Web – The Occupiers and Their Policies". French Studies, University of Birmingham. Archived from the original on 11 October 2017. Retrieved 18 June 2017. ^ Philip G. Nord (2010). France's New Deal: From the Thirties to the Postwar Era. Princeton U.P. p. 12. ISBN 9780691142975. Archived from the original on 24 October 2015. Retrieved 1 July 2015. ^ Stanley G. Payne (1983). Fascism: A Comparative Approach Toward a Definition. U. of Wisconsin Press. p. 137. ISBN 9780299080648. Archived from the original on 24 October 2015. Retrieved 1 July 2015. ^ Laqueur, Walter (1978). Fascism: A Reader's Guide. U. of California Press. p. 298. ISBN 9780520036420. Archived from the original on 27 September 2015. Retrieved 1 July 2015. ^ Singer, Barnett (2008). 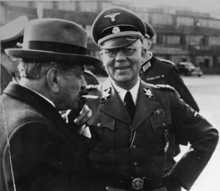 Maxime Weygand: A Biography of the French General in Two World Wars. McFarland. p. 111. ISBN 9780786435715. Archived from the original on 1 November 2015. Retrieved 1 July 2015. ^ Richard Joseph Golsan (2000). The Papon Affair: Memory and Justice on Trial. Psychology Press. p. 14. ISBN 9780415923651. Archived from the original on 2 November 2015. Retrieved 1 July 2015. ^ Jean-Pierre Maury. "Loi constitutionnelle du 10 Juillet 1940". Mjp.univ-perp.fr. Archived from the original on 23 July 2001. Retrieved 31 May 2011. ^ "Constitutional act no. 2, defining the authority of the chief of the French state". Journal Officiel de la République française. 11 July 1940. Archived from the original on 8 December 2015. Retrieved 24 October 2015. ^ Jean-Pierre Maury. "Actes constitutionnels du Gouvernement de Vichy, 1940–1944, France, MJP, université de Perpignan". Mjp.univ-perp.fr. Archived from the original on 4 December 2012. Retrieved 31 May 2011. ^ "Canada and the World: A History". International.gc.ca. 31 January 2011. Archived from the original on 11 August 2011. Retrieved 31 May 2011. ^ Lawrence Journal-World – Aug 22, 1944 Archived 26 January 2016 at the Wayback Machine. Retrieved 17 January 2016. ^ "Les ÉFO dans la Seconde Guerre Mondiale : la question du ralliement et ses conséquences". Itereva Histoire-Géographie. 5 November 2006. Archived from the original on 17 August 2011. Retrieved 16 March 2011. ^ "Citation of the bataillon d'infanterie de marine et du Pacifique for valor during the fourth battle of Monte Cassino". 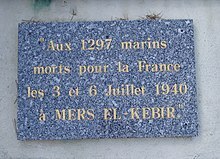 22 July 1944. Archived from the original on 11 July 2011. Retrieved 16 March 2011. ^ "Le Bataillon d'infanterie de marine et du Pacifique (BIMP)". Archived from the original on 23 July 2011. Retrieved 16 March 2011. ^ "Document 3: le choix des Nouvelles-Hébrides". 17 July 2010. Archived from the original on 28 September 2011. Retrieved 16 March 2011. ^ Lestrade, Claude (1997). "Le ralliement de Wallis à la " France libre " (1942)". Journal de la Société des Océanistes. 105 (105): 199–203. doi:10.3406/jso.1997.2029. Archived from the original on 21 July 2011. Retrieved 16 March 2011. 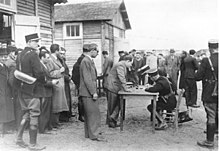 ^ "Saline royale d'Arc et Senans (25) – L'internement des Tsiganes". Cheminsdememoire.gouv.fr. Archived from the original on 21 May 2011. Retrieved 31 May 2011. ^ "Vichy discrimination against Jews in North Africa". United States Holocaust Memorial Museum (ushmm.org). Archived from the original on 6 May 2009. Retrieved 31 May 2011. 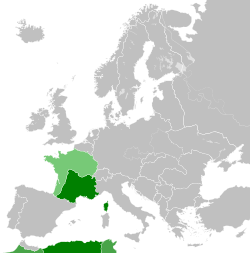 ^ "Jewish population of French North Africa". United States Holocaust Memorial Museum (ushmm.org). 6 January 2011. Archived from the original on 6 May 2009. Retrieved 31 May 2011. ^ "Jews in North Africa: Oppression and Resistance". United States Holocaust Memorial Museum (ushmm.org). Archived from the original on 3 August 2009. Retrieved 31 May 2011. ^ "Jews in North Africa after the Allied Landings". United States Holocaust Memorial Museum (ushmm.org). Archived from the original on 6 May 2009. Retrieved 31 May 2011. ^ "The Holocaust: Re-examining The Wannsee Conference, Himmler's Appointments Book, and Tunisian Jews". Nizkor.org. Archived from the original on 4 June 2011. Retrieved 31 May 2011. ^ Quoted in Andrés Horacio Reggiani. Alexis Carrel, the Unknown: Eugenics and Population Research under Vichy Archived 4 February 2007 at the Wayback Machine (French historical studies, 25:2 Spring 2002), p. 339. Also quoted in French by Didier Daeninckx in "Quand le négationnisme s'invite à l'université". amnistia.net. Archived from the original on 16 March 2007. Retrieved 28 January 2007. ^ ""France" in U.S. Holocaust Memorial Museum online Holocaust Encyclopedia". Ushmm.org. Archived from the original on 1 September 2012. Retrieved 31 May 2011. ^ a b Simons, Marlise (17 July 1995). "Chirac Affirms France's Guilt In Fate of Jews". The New York Times. ISSN 0362-4331. Archived from the original on 7 December 2017. Retrieved 16 December 2017. ^ McAuley, James (10 April 2017). "Marine Le Pen: France 'not responsible' for deporting Jews during Holocaust". Washington Post. ISSN 0190-8286. Archived from the original on 13 January 2018. Retrieved 16 December 2017. ^ a b "France opens WW2 Vichy regime files". BBC News. 28 December 2015. Archived from the original on 9 November 2017. Retrieved 16 December 2017. ^ "Allocution de M. Jacques CHIRAC Président de la République prononcée lors des cérémonies commémorant la grande rafle des 16 et 17 juillet 1942 (Paris)" (PDF). www.jacqueschirac-asso (in French). 16 July 1995. Archived (PDF) from the original on 24 July 2014. Retrieved 17 July 2014. ^ a b "'France organised this': Macron denounces state role in Holocaust atrocity". The Guardian. 17 July 2017. ISSN 0261-3077. Archived from the original on 24 October 2017. Retrieved 16 December 2017. ^ a b c d Goldman, Russell (17 July 2017). "Macron Denounces Anti-Zionism as 'Reinvented Form of Anti-Semitism'". The New York Times. ISSN 0362-4331. Archived from the original on 28 January 2018. Retrieved 16 December 2017. ^ McAuley, James (16 July 2017). "Macron hosts Netanyahu, condemns anti-Zionism as anti-Semitism". Washington Post. ISSN 0190-8286. Archived from the original on 1 February 2018. Retrieved 16 December 2017. ^ "Israel PM mourns France's deported Jews". BBC News. 16 July 2017. Archived from the original on 5 December 2017. Retrieved 16 December 2017. ^ a b Jean-Pierre Maury. "Ordonnance du 9 août 1944 relative au rétablissement de la légalité républicaine sur le territoire continental". Mjp.univ-perp.fr. Archived from the original on 8 February 2012. Retrieved 31 May 2011. ^ Jean-Pierre Maury. 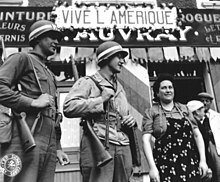 "Ordonnance du 21 avril 1944 relative à l'organisation des pouvoirs publics en France après la Libération". Mjp.univ-perp.fr. Archived from the original on 21 March 2013. Retrieved 31 May 2011. ^ "Flemish Legion Military and Feldpost History". Axis and Foreign Volunteer Legion Military Awards & Postal History. Archived from the original on 24 February 2009. Retrieved 23 May 2009. ^ "Accession Plans". german-foreign-policy.com. 11 December 2007. Archived from the original on 23 July 2011. Retrieved 23 May 2009. ^ Helm, Sarah (16 February 1996). "War memories widen Belgium's communal rift". The Independent on Sunday. Archived from the original on 31 January 2012. Retrieved 23 May 2009. 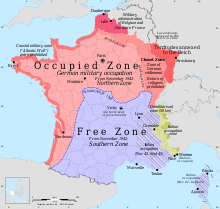 ^ "Vichy France Facts". World War 2 Facts. Archived from the original on 13 January 2014. Retrieved 12 January 2014. ^ Kitson, Simon. "Bousquet, Touvier and Papon: Three Vichy personalities" (PDF). Archived (PDF) from the original on 20 May 2011. Retrieved 30 March 2011. ^ One of the first legal acts of the provisional government was to pass an ordinance reestablishing the rule of law: Ordonnance du 9 août 1944 Archived 8 February 2012 at the Wayback Machine relative au rétablissement de la légalité républicaine sur le territoire continental, article 1: "The form of government of France is and stays the Republic. In law, the Republic never ceased to exist." article 2: "Thus, all constitutional acts, statutes and regulations, and decisions taken for the execution thereof, taken after 16 June 1940 up to the reestablishment of the provisional government of the French Republic, are null and devoid of effects." ^ "Obituary: Rene Bousquet". The Independent. 9 June 1993. Archived from the original on 16 December 2017. Retrieved 16 December 2017. ^ "Marine Le Pen denies French role in wartime roundup of Paris Jews". The Guardian. 9 April 2017. ISSN 0261-3077. Archived from the original on 3 February 2018. Retrieved 16 December 2017. ^ Whitney, Craig R. (18 February 2007). "Maurice Papon, Convicted Vichy Official, 96, Dies". The New York Times. ISSN 0362-4331. Archived from the original on 16 December 2017. Retrieved 16 December 2017. ^ Curtis, Michale (2013). 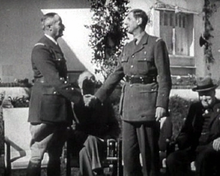 Verdict On Vichy: Power and Prejudice in the Vichy France Regime. Skyhorse. p. 108. ISBN 9781628720631. Archived from the original on 26 January 2016. Retrieved 25 October 2015. ^ Whitney, Craig R. (3 April 1998). "Ex-Vichy Aide Is Convicted And Reaction Ranges Wide". The New York Times. ISSN 0362-4331. Archived from the original on 2 February 2018. Retrieved 2 February 2018.